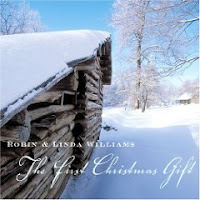 A swapping of stories around the kitchen table in the snowy forests of the Smokeys, in the quiet valleys of Kentucky, along the coast of Georgia, down through the wiregrass in Alabama, in the Shenandoah of Virginia, through the coalfields of West Virginia, the piney wood hills of north Florida -- Robin and Linda Williams write and sing music that holds the spirit of all these southern places and connects with family, home, and holiday beyond their southern roots. Many of the dozen songs here are original ones, including the spiritual style title track, and one that gets my vote for unique title for a holiday song, Shotgun Shells on a Christmas Tree. That’s a really good story, too, holding within its short span of verses humor, compassion, gentleness, and healing. The pair do a fine job with their chosen carols and covers, too, among them John Prine’s Silent Night, All Day Long and Brightest and Best. Threads that bring all the stories together are found in On a Quiet Christmas Morn, as the couple reaches into the holiday hush for the connection to love that lives within in it. They then send listeners on their way to celebration with the closing song, Go Tell It on the Mountain. It’s a collection to keep, and to sing along with, on long winter nights as the holiday draws near.